Fort Keogh is a former United States Army post located at the western edge of modern Miles City, in the U.S. state of Montana. It is situated on the south bank of the Yellowstone River, at the mouth of the Tongue River. Colonel Nelson A. Miles, commanding the 5th Infantry Regiment, founded the post in August 1876, in the wake of the Battle of the Little Bighorn, as a base for patrols to prevent the Cheyenne and Sioux involved in the battle from escaping to Canada. The fort was originally known as the Tongue River Cantonment for two years. When relocated one mile west in 1878, it was renamed Fort Keogh in honor of Captain Myles Keogh, who was killed at the Little Bighorn. In 1877, the fort became the headquarters for the newly created District of the Yellowstone (a sub-unit of the Department of Dakota), which was commanded by Miles. The development of Fort Keogh as a military installation soon stimulated traders to supply the liquor and other service businesses that were the beginning of Miles City. Today the former military post is a United States Department of Agriculture livestock and range research station. It is listed on the National Register of Historic Places. Shortly after the defeat of Lieutenant Colonel George Armstrong Custer at the Battle of the Little Bighorn on June 25, 1876, the Army sent the 5th U.S. Infantry Regiment, under the command of Nelson A. Miles, from Nebraska to the plains of eastern Montana to establish a military fort. The order for development of the fort was signed on August 28, 1876. The Army's intended use for its garrison at the post was to reduce warfare by the American Indians in the region and to persuade them to resettle on reservations. Colonel David S. Stanley had originally scouted the first site of the fort during the Yellowstone Expedition of 1873. He thought the location would be good for supplying troops throughout the region, but the Army did not decide to build the fort until after Custer's overwhelming defeat at the Battle of the Little Bighorn. As developers planned to bring the Great Northern Railway to the region, the U.S. Army was assigned to survey the land and develop maps. The troops came into contact with two tribes of Indians, the Lakota (Sioux) and the Crow. The Sioux had pushed the Crow west of their traditional lands as they moved west, in response to European–American settlers encroaching on Sioux territory. Resentful of the Sioux, the Crow frequently allied with the Army and served as scouts to its expeditions. General Miles established the "Cantonment Tongue River" at the confluence of the north-flowing Tongue River and the east-flowing Yellowstone River. The site would provide easy access to boats bringing supplies up the Yellowstone. The original cantonment was referred to by several names during its first two years, including New Post on the Yellowstone, Cantonment on Tongue River, and Tongue River Barracks, before the Army officially named it Fort Keogh on November 8, 1878. Miles was well-respected as a leader, not only by his troops, but also by the Indians. Promising fair treatment and better lives to the Native Americans, Miles gradually persuaded the Indian nations to settle on the reservations. Not all the nations surrendered immediately. Miles went to battle against the holdouts with his troops, including during the extreme cold of winter. The Sioux and Crow bands migrated through wide areas in the Montana Territory, and troops were engaged in battle with them hundreds of miles from the fort. When the 5th Infantry left the fort in 1888, the 22nd Infantry Regiment (which had had several companies stationed there since 1876), took over the garrison, and the regimental headquarters with the entire regiment were moved to the post in 1888 and would remain until 1896. [a] In 1888, Company H of the 8th U.S. Cavalry arrived to garrison at Keogh after marching from Fort Davis, New Mexico, and Company L of the 8th Cavalry joined the garrison after marching from Fort Hancock, Texas. Fort Keogh was named for Myles Keogh, a Captain (brevet Lieutenant Colonel) and commander of Company I in the 7th U.S. Cavalry under Lt. Col. (brevet Major General) George Armstrong Custer, both of whom were killed in the Battle of the Little Bighorn. Born in Ireland on March 25, 1840, Keogh came from a comfortable background. Wanting adventure, Keogh left the farming to a brother and went off to war. In 1860, he went to Italy after the Pope recruited Irish men to take up the fight to save the Papal States. In those battles, he won two medals. Later Keogh joined the Papal Guard in Rome. Keogh preferred warfare to acting as a guard; he resigned his post and in March 1862 headed to the United States to serve in the American Civil War. He was commissioned as a Captain in the Union Army and proved his ability repeatedly. 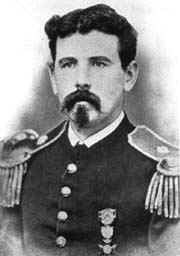 He won many commendations, and his bravery in the Battle of Gettysburg under Brigadier General John Buford earned him the rank of brevet Major. Keogh took an assignment in the western wars in 1863; he served under Custer until his death in battle. Keogh stood his ground, with the company he commanded around him; they were surrounded and outnumbered by Sioux warriors. His body was later found in the center of those of his soldiers. The Army later found his horse, Comanche, walking riderless on the battlefield. Soldiers nursed the horse to health, and he became a legend. The arrival of the Army generated a demand for businesses among enterprising traders. Named after the fort's commander, Nelson A. Miles, Milestown developed first as an army town to meet the needs of young, isolated servicemen. According to the diaries kept by George Miles, the nephew of the Colonel who traveled with his uncle, a man named Mat Carrol set up some barrels under a tarp and started selling whiskey. When Colonel Miles got tired of having his guard house filled to overflowing--whiskey causing him, Miles said, more trouble than the Indians--he ordered Carrol and the other purveyors of liquor to leave the military reservation. An employee of Carrol's, one John Carter, rode east on his big bay horse until he was the required two miles (3 km) away, beyond the edge of the reservation. He found a flat spot along the Yellowstone, built a crude log hut out of driftwood and started selling whiskey. The soldiers soon found the place, other merchants followed, and Miles City was born. Milestown was at first almost nothing but rowdy; many a drunken soldier emerged from its saloons. About a year after settling in the area, General Miles moved the fort to the present location just a couple of miles southwest of the original site. He hoped that the extra distance from the town would slow the unruliness. The town picked up and moved to its current location closer to the fort. In his book Recollections of Old Milestown, Samuel Gordon described a frontier confrontation. Riverside Park, which still stands today, was rumored to be up for the taking. The "Old West" rule was that if a man were to get four logs placed on the ground in a square, he had the foundation of a building, and could claim the land as his. One such squatter had placed two of the needed logs, and went to get the other two. A second man saw the two logs and an opportunity. He placed his two logs with the two currently on site and stood his ground there. He expected the first man to object and leave. The first squatter was dismissed by the second squatter with, "two logs counted nothing". But the first man pulled out his revolver to settle the dispute. The second man quickly abandoned his claim to the area. Late in the afternoon, tales of the incident reached the fort. Soldiers came out and sent away all the squatters in the area. In 1900, the infantry and cavalry post at Fort Keogh became an army remount station. Infantry troops were withdrawn from the fort in 1907. During World War I, Fort Keogh served as a quartermaster's depot. The Fort Keogh remount station processed more horses for World War I than any other post, shipping them all over the world. The U.S. Department of the Interior took over the Fort Keogh military reservation in 1924. As of 2012, it is home to the USDA Fort Keogh Range and Livestock Experiment Station. The Station's Line 1 Hereford Herd has played a key role in the genetic research of Hereford cattle. By an Act of Congress dated April 15, 1924 (PL90, 43 Stat. 99) jurisdiction of the Fort Keogh Military Reservation was transferred to the U.S. Department of Agriculture for experiments in stock raising and growing of forage crops. Onsite remains of the original Fort include the parade ground, a wagon shed built in 1883, the flag pole erected in 1887, and seven other structures built prior to 1924. The size of the original Fort Keogh Military Reservation was 100 square miles or 64,000 acres. The Fort Keogh Livestock and Range Research Laboratory now occupies about 55,357 acres. In 1878, a large piece of land east of the Tongue River was released by the Army and is now the present site of the City of Miles City. Since that time, additional land has been released for the Miles City industrial sites, Custer County fairgrounds, the warm-water fish hatchery and Spotted Eagle Recreation Area. Approximately 1,800 acres are under irrigation in the Yellowstone River Valley west of the Laboratory headquarters. About 625 acres are in cultivated crops and 1150 in irrigated pastures. The remainder of the laboratory is rough, broken badlands typical of range cattle producing areas of the Northern Great Plains. In 1954 the United States Air Force opened the 902nd Aircraft Control and Warning station on the reservation about two miles south of the Yellowstone River and ten miles west of Miles City. This station was part of the Cold War air defense system protecting the United States in case of war with the Soviet Union. The station operated until 1968 when it was closed because of the advance of electronics in radar detection. At any given time there were in the neighborhood of 100 to 125 airmen and officers stationed at this location. The Range Riders Museum, located on the original Fort Keogh cantonment in nearby Miles City, Montana, offers historical exhibits of the fort's days as Milestown. Guinness World Records reports that the largest natural snowflake ever recorded, measuring 15 inches (38 cm) in diameter, fell at Fort Keogh on January 28, 1887. Skating party, Ft. Keogh, Mont., about 1890. ^ A website on the 22nd Infantry also offers a link to a downloadable thesis, Fort Keogh: Cutting Edge of a Culture by Josef James Warhank, that chronicles the fort's complete military history. ^ "MONTANA - Custer County". National Register of Historic Places. Retrieved 2007-04-18. ^ a b c Warhank, Josef James (December 1983). "Fort Keogh: Cutting Edge of a Culture" (PDF). Agricultural Research Service, USDA. Retrieved 2007-04-18. ^ a b "Guide to the Fort Keogh (Mont.) Collection 1864-1892". Retrieved 2012-01-27. ^ "22nd Infantry Regiment at Fort Keogh 1888-1896". Retrieved 2012-01-27. ^ a b c Pohanka, Brian C. (September 1, 2003). "'Born a Soldier': Myles Walter Keogh". The Wild Geese.com. Retrieved 2007-04-18. ^ "milescity.com: history". Retrieved 2012-01-27. ^ Gordon, Samuel (c. 1918). Recollections of Old Milestown. Miles City, Montana: Independent print. co.
^ a b "Miles City, Montana : Historical Perspective". Retrieved 2012-01-27. ^ Terry Adams (2011-05-13). "Line 1 Hereford herd at Fort Keogh key to decades of research". The Prairie Star. Great Falls, MT. Retrieved 2012-01-27. ^ "Range Riders Museum". Retrieved 2012-01-27. Warhank, Josef James (December 1983). "Fort Keogh: Cutting Edge of a Culture" (PDF). Agricultural Research Service, USDA. Retrieved 2007-04-18. Barnes, Jeff. (2008). Forts of the Northern Plains: Guide to Historic Military Posts of the Plains Indian Wars. Mechanicsburg, PA: Stackpole Books. The Battle of Pumpkin Creek, also known as the Volborg fight, was fought February 7–8, 1880, by United States Soldiers, and Scouts, against Sioux warriors. The Battle occurred near Pumpkin Creek, a tributary of Toungue River, in Montana Territory, in present-day Montana, United States. Camp Devin was a temporary United States Army camp established on June 30, 1878 during the building of the Fort Keogh-Deadwood Telegraph Line. It was named for Brevet Brigadier General Thomas C. Devin, and abandoned in late 1878. Camp Merritt was a United States army camp established in December, 1891 at the Northern Cheyenne Agency. It was named for Brevet Major General Wesley Merritt, and abandoned in 1899. Camp Poplar River was established during the Indian wars in the Department of Dakota by U.S. Army to maintain order, keep non-agency Indians away, and help capture the Indians who disturbed the peace and would not conform to reservation boundaries of the Fort Peck Agency, which in 1878, was relocated to its present-day location in Poplar because the original agency was located on a flood plain, suffering floods each spring. The post was located one-half mile north of the then called, Poplar River Agency, or 2 miles north of the Missouri River on the south bank of the Poplar River and normally consisted of only two companies of infantry. This tiny post has disappeared except for the fact that the town of Poplar, Montana, on the site, bears the same name. Donald Stevenson (April 12, 1833 - 1908) was a cattleman and politician in North Dakota, US. A state assemblyman, he was also the first elected Emmons County treasurer. Fred Burns (April 24, 1878 – July 18, 1955) was an American actor who mainly appeared in Western films. He appeared in over 265 films before his death in 1955. Joseph Nelson Garland Whistler (October 19, 1822 – April 20, 1899) was a career United States Army officer. He served in the Mexican–American War and received a brevet appointment for distinguished service in the Battle of Contreras and the Battle of Churubusco. At the beginning of the American Civil War, Whistler was among the U.S. Regular Army officers taken prisoner by Confederates in Texas in April 1861 and paroled but was not exchanged until August 15, 1862. In 1863, he became colonel of the 2nd New York Heavy Artillery Regiment. He received a promotion and four brevet appointments in the regular army for his service during the Overland Campaign, specifically the Battle of North Anna, and the Siege of Petersburg, specifically the Second Battle of Petersburg. He was nominated on January 13, 1866 and confirmed on March 12, 1866 for appointment to the grade of brevet brigadier general of volunteers, to rank from March 13, 1866. He retired in on October 19, 1886 as colonel of the 15th U.S. Infantry Regiment. Laton Alton Huffman (October 31, 1854 – February 28, 1931) was an American photographer of Frontier and Native American life. Born in Winneshiek County, Iowa, he spent most of his life photographing the area around his Montana home. Having initially worked at Fort Keogh, he started to sell prints of his glass plate negatives. There are at least 8 named cemeteries in Custer County, Montana. Some cemeteries are considered historical by the U.S. Board on Geographic Names: Historical Features – features that no longer exist on the landscape or no longer serve the original purpose. There are at least 60 current and former U.S. military installations located in Montana. Installations listed as historical are no longer in service and may have no physical remains in the state. Little Shield (Cheyenne language: A-che-kan-koo-eni) was a chieftain of the Northern Cheyenne from 1865–1879. He is known for creating a collection of ledger drawings accounting the Indian wars along the North Platte river. Little Shield also fought in the Battle of Little Bighorn, leading the Dog Soldiers. Following the Battle of the Little Bighorn, the US Army increased attempts to capture the Cheyenne. In 1877, after the Dull Knife Fight, when Crazy Horse surrendered at Fort Robinson, a few Cheyenne chiefs and their people surrendered as well. The Cheyenne chiefs who surrendered at the fort were Dull Knife, Little Wolf, Standing Elk, and Wild Hog, with nearly 1,000 Cheyenne. Later that year Two Moon surrendered at Fort Keogh with 300 Cheyenne. The Cheyenne wanted and expected to live on the reservation with the Sioux in accordance to an April 29, 1868 treaty of Fort Laramie, which Dull Knife, Little Wolf and also Little Shield had signed.In the fall of 1878 somewhere beyond the North Platte River after crossing into Nebraska the Cheyenne held council and it was discovered that 34 of the original 297 were missing, most had been killed but a few had decided to take other paths to the north. This is where the Cheyenne split into two groups. Those that wished to stop running, including Little Shield, Wild Hog and Left Hand, planned to go with Dull Knife to the Red Cloud Agency. The Cheyenne that decided to keep heading to the Power River country followed Little Wolf. Little Shield lead the remaining Dog Soldiers who had stayed with Dull Knife. On October 23, 1878 Dull Knife's band of Cheyenne, in a blinding snowstorm, discovered that they were surrounded by the army; the encounter was accidental, neither party having seen the other due to the snow. Dull Knife convinced his band not to attack the soldiers. The army offered some food and a few blankets to the Cheyenne and suggested a move to a better camp nearby at Fort Robinson in northwestern Nebraska. There the army confiscated the Cheyenne ponies but distributed more rations, including sugar and coffee. The next morning after a two-hour council, the Cheyenne agreed to turn over their weapons. However they turned over only the older ones, concealing many. After hearing that Red Cloud and Spotted Tail had been relocated to Pine Ridge, Dull Knife decided, due to the weather and his people's condition, to go to Fort Robinson. The Cheyenne decided that night to take apart their best guns, women hid the barrels under their clothing and the smaller pieces were attached to cloths and moccasins as ornaments. Without telling the Cheyenne, it was determined by November 22 by Carl Schurz, the Secretary of the Interior that the Cheyenne would be returned to the south. That was also the course recommended by General Phillip Sheridan, commander of the Division of Missouri.When the Cheyenne refused to return to the reservation in the south, bars were put on windows and no rations were given, including wood for heat. On January 9, 1879 Dull Knife still refused to go back south, however Wild Hog and Left Hand had agreed to talk but said their people would not go. Upon hearing this Wild Hog was held as a prisoner and shackled. That night the Cheyenne tried to make a daring escape using the dismantled guns they had hidden upon arriving at the fort. The Cheyenne were immediately followed and many were killed, Little Shield among them. The McCone Residence in Glendive in Dawson County, Montana was listed on the National Register of Historic Places in 1988.It is a small one-story L-shaped house built during 1893 to 1903, probably by carpenter John A. Morton, and was expanded during 1903-1905 and again during 1905-1910. It was home in 1909 to George McCone (b.1854), a pioneer settler in this area. He had been mail carrier between (Oklahoma's?) Fort Reno and Fort Sill in 1877, was mail carrier between Bismarck, North Dakota and Fort Keogh in 1881, and was mail carrier between Glendive and Fort Buford and Wolf Point in 1882. He was on the first board of county commissioners for Dawson County, and he is the namesake of McCone County (created in 1919).It was listed on the National Register as a result of a study of multiple historic resources in Glendive which also listed several others. Minnie Hollow Wood lived on the Cheyenne reservation in Montana and became an informant of author and ethnologist Thomas Bailey Marquis. Marquis suggested that she was a "favorite" of Miles while she was a prisoner at Fort Keogh. The Mizpah Creek incidents, were a series of incidents that occurred from April 5 – June 8, 1879, between United States soldiers and civilians, and eight Northern Cheyennes, that resulted in the death of one U.S. soldier, and the capture of the eight Cheyenne, three of whom committed suicide in prison at Miles City, Montana Territory. The incidents occurred near Mizpah Creek, a tributary of the Powder River, in Montana Territory. The Northern Cheyenne Exodus, also known as Dull Knife's Raid, the Cheyenne War, or the Cheyenne Campaign, was the attempt of the Northern Cheyenne to return to the north, after being placed on the Southern Cheyenne reservation in the Indian Territory, and the United States Army operations to stop them. The period lasted from 1878 to 1879. Powderville, also Elkhorn Crossing is an unincorporated community in northeastern Powder River County, Montana, United States, along the Powder River. It is a small cluster of buildings that lies along local roads northeast of the town of Broadus, the county seat of Powder River County. Its elevation is 2,828 feet (862 m). Red Armed Panther, or Red Sleeve (also known as Red Around the Mouth, Red Arm, and Bloody Arm), was a Northern Cheyenne Scout at Fort Keogh during the late 1870s. He was brought into the Chiefs Council of Forty-four during the summer of 1864. He actively participated during Chief Little Wolf’s trail back to the homeland, which is now the Northern Cheyenne Reservation located in the south eastern part of Montana. He put his life on the line to save his comrade, Black Horse, during a horse stealing raid. He had a large family growing up, with six sisters and a brother. He had two children, Shell Woman and “Man Bear,” known as John Red Sleeve. The exact date of his death is uncertain, but he died in his home of electrical shock in the Muddy Cluster district on the Northern Cheyenne Reservation. Two Moons (1847–1917), or Ishaynishus (Cheyenne: Éše'he Ôhnéšesêstse), was one of the Cheyenne chiefs who took part in the Battle of the Little Bighorn and other battles against the United States Army.